I need to play a little bit of catch up, I have a few posts to write that I just haven’t had time for in the past few days. I will be posting dates for these shops since I am a few days behind, because some of the coupons have since expired and deals may no longer be available – I don’t want there to be any confusion if someone wants the same deal. I made this purchase on December 28, 2011 at Shoppers Drug Mart. 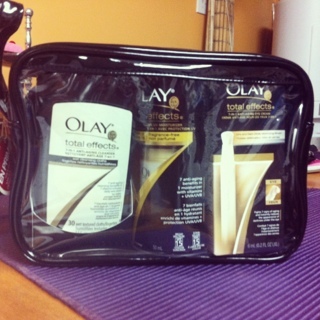 The Olay Total Effects products are worth $70 at Shoppers Drug Mart if you buy then all separate! SCORE! I haven’t decided if I am going to use this myself or save it for a gift – it would make a very nice gift. This entry was posted in canadian coupons, coupons, deals, shoppers drug mart and tagged canadian coupons, coupons, deals, shoppers drug mart on January 3, 2012 by Courtnie.